1. Preheat the oven to 145˚C and line a large baking tray with parchment paper. 2. Place the aquafaba into a clean mixing bowl of a kitchen mixer and beat on full speed for 60-90 seconds until light and foamy. 3. Turn the speed of the mixer down and slowly add the caster sugar in 3-4 stages. 4. Turn the mixer back on full speed and whisk until stiff peak and glossy is achieved . Add then, the vanilla extract to flavour the meringue. 5. Using a piping bag, pipe walnut size mini meringues onto a prepared baking tray. Place in a preheated oven and bake for 20-30 minutes until the meringues are firm to touch but still soft on the centre. Remove from the oven and leave to cool for 10-15 minutes. 6. In the meantime, in a saucepan, heat the honey with the rhubarb, orange zest and juice. Cook over a low heat for 3-5 minutes until slightly soften. Remove from the heat and leave to cool. 7. 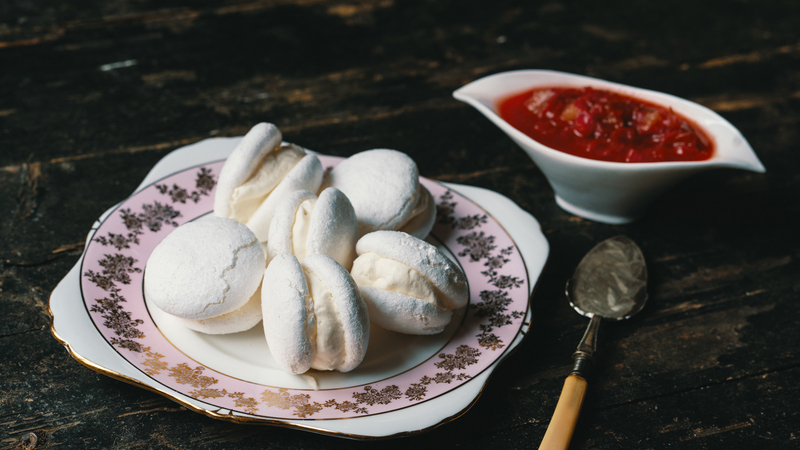 To serve, spoon a teaspoon of whipped cream onto the meringues and some rhubarb compote. 8. Once sandwiched with the cream serve immediately.